Chapter 5 of the 2015 IBC has been heavily revised. However, the revisions focus primarily on format and are not intended to be technical in nature. The increases for both height and area, when sprinklers are installed, are now integrated into the tables with separate tables used for height and area. In general, there are two passive measures that decrease a building’s fire hazard: isolating the building from other structures and constructing the building with fire-resistive materials. IBC Chapter 5 provides for increases to the allowable area factor in Table 506.2 for the addition of open perimeter spacing and the use of fire-resistive assemblies. Isolating a building from adjacent structures decreases the fire hazard of a building as well as that of adjacent structures. 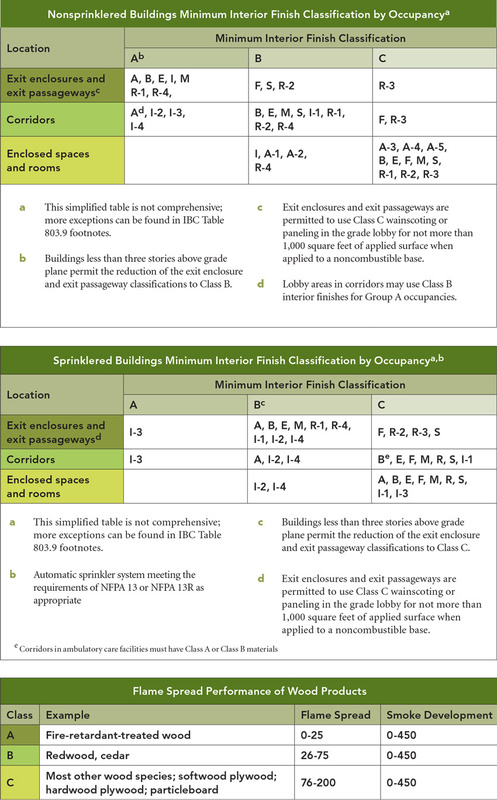 The allowable area of a building is determined in accordance with the applicable provisions of Sections 506.2.1 through 506.2.4 and Section 506.3. In a single occupancy building with no more than one story above grade plane, allowable area is determined in accordance with Equation 5-1. Buildings located next to a public way or open space adjoining a public way, with the exterior wall a minimum of 20 feet from the public way for more than 25% of the building perimeter, may qualify for an area factor increase based on frontage distance in accordance with Equations 5-4 and 5-5.
associated with that portion of the exterior perimeter wall. F = Building perimeter that fronts on a public way or open space having a width of 20 feet (6,096 mm) or more. It should be noted that frontage widths (W) greater than 30 feet will only receive credit for a value of 30 feet. The maximum increase that can be obtained for frontage would occur when 100% of the perimeter has frontage of 30 feet or more and would result in a 75% floor area increase.